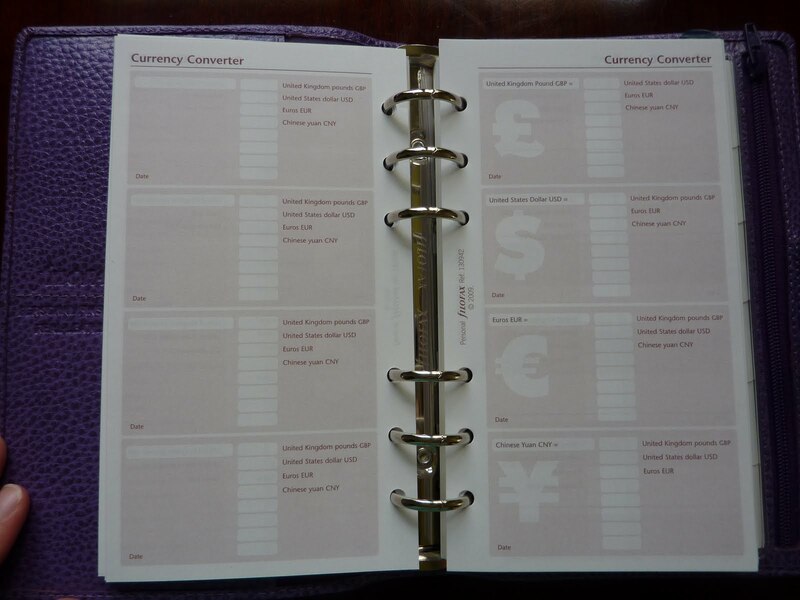 Here is an excellent guest post from Bernhard about his very first Filofax! Thanks Bernhard!! 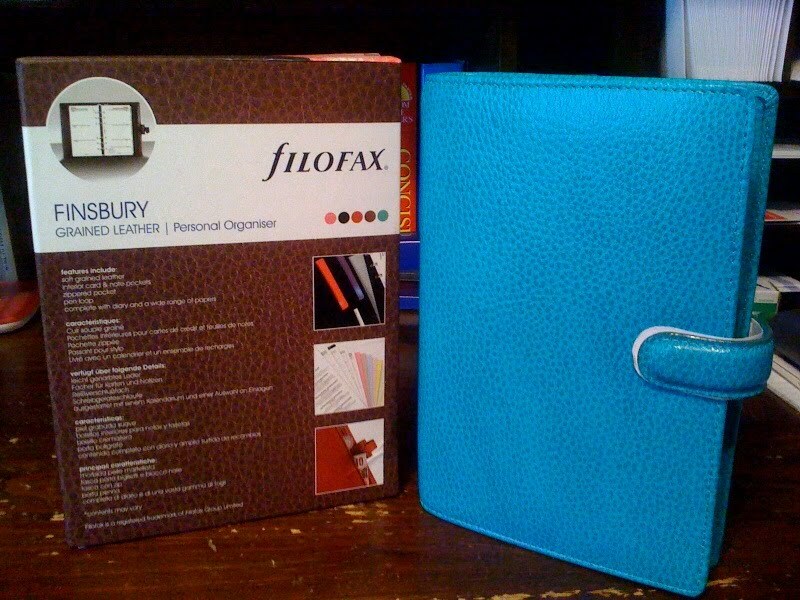 The first Filofax binder I ever bought was a Personal Buckingham in 1987. I had traveled to London where my sister started her academic career and I could stay at her house to discover the Lewisham surroundings in the south east. As I wrote in an other article, I met locals who were convinced that the legendary Wembley goal of 1966 was regular. Since June 27, 2010 the English national team had a similar goal - but it was not accepted and the Brits had to leave the championship. Nevermind: In Lewisham Highstreet I bought my Buckingham Personal. It still has a golden "Made in England" and "Real Calf" stamp and its leather and mechanical quality has never let me down - although I've used this Filo for over 20 years by now. The old Filo is back in heavy use now because paper organisers are unbeatable in easy handling, reliability and independence of electrical energy - last being the reason why my Filo offers no GPS and MP3. The Buckingham is or was "simply styled with a full length pocket at the front and back of the wallet" as quoted from a Filofax catalogue of the same year. Now let me explain my personal sections. Section 1 is for free notes such as ideas, to-do's and smaller calculations. 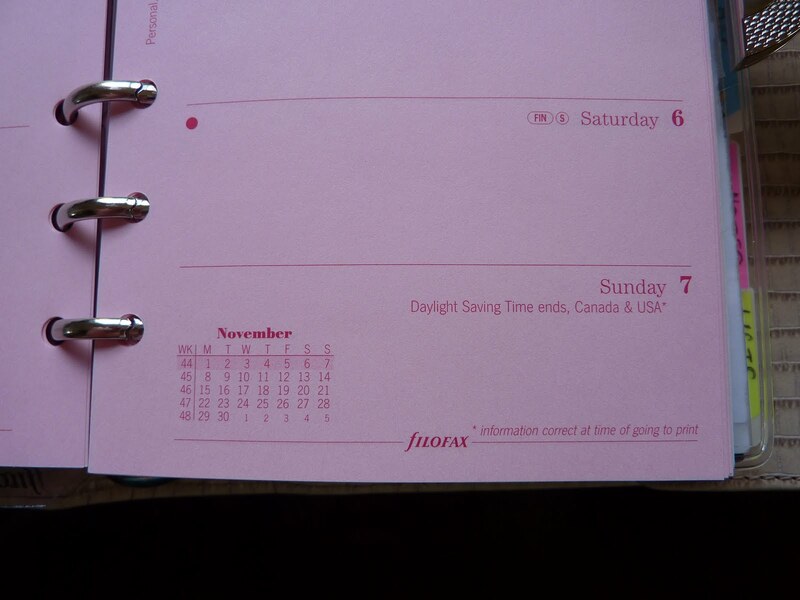 Section 2 is a week on 2 pages diary in the horizontal version. It is more convenient to write the papers on the left side. With the Filofax ruler attached to the up-to-date week, the daily calender is easily and fast to find after opening the binder. Section 3 is structured by a register from A to Z. Here I store notes, information and data which will not change suddenly. For instance, a city map of Munich is archived at "M", my birthday list under "G" for the German word "Geburtstag" and phone numbers are under "T" for "Telefon". Section 4 is for transparent envelopes and credit card holders where I carry my business and credit cards, some photos and personal memories. 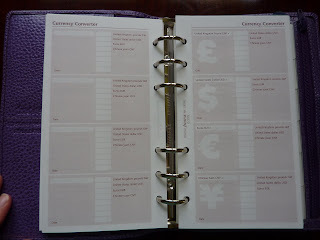 It's a quite simple system - but that's what an daily organiser should be. 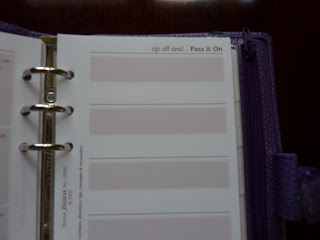 I hope some of you get inspired by this simplicity - as I was inspired by Philofaxy to use sticky notes in the calendar for certain tasks and deadlines. Anybody interested in stories about my entire collection of Filofax binders and some vintage stuff from the late 1980-s and early 1990-s? 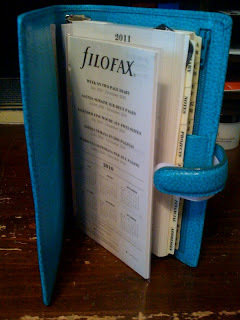 At long last, here is my review of the Filofax Travel Journal insert! This was very generously given to me as a sample by Brigitte at the Filofax shop in London. (Many thanks again to Brigitte!) Sorry it has taken me so long to post a review! I wanted to wait until I had the time to give it the time and attention it deserves, because this is a very nifty packet indeed. I didn't take photos of all of the features of this packet, because you can flip through the pages on the Filofax Travel Journal Lifestyle Pack website. But I did take several photos to show you many of the features and to give you an idea of what it looks like in action. 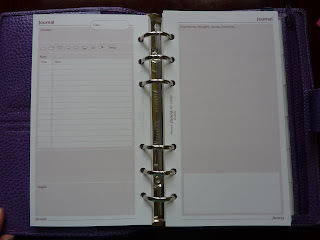 Each 2-page spread has space to record your plans for the day (general itinerary, things to see and do, people to meet) and to write your memories. I like the little icons you can circle to indicate the day's weather. 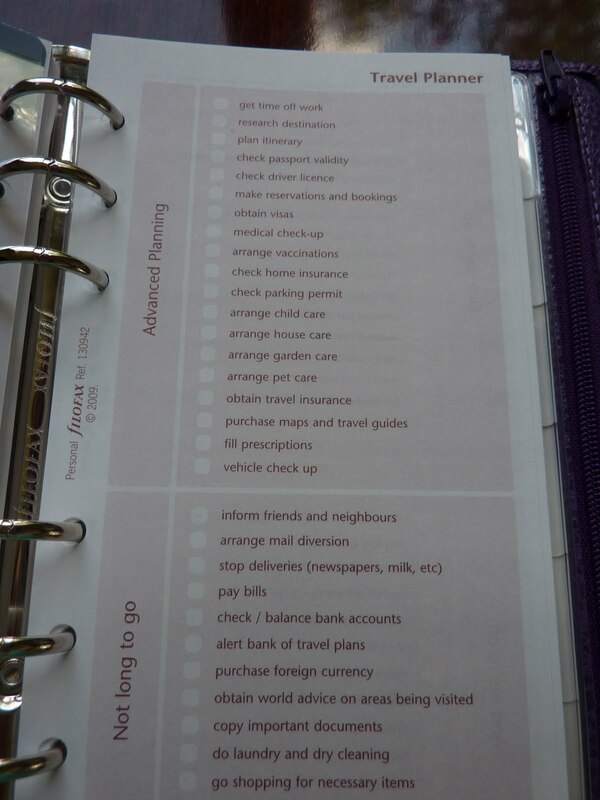 There's loads of cool pages to help you plan your trip and keep you organized along the way. The Travel Itinerary pages give you a place to consolidate all your transportation and lodging information. The Personal Information pages give you a one-page directory of your ID numbers, doctor and dentist contact info, insurance and medical information. 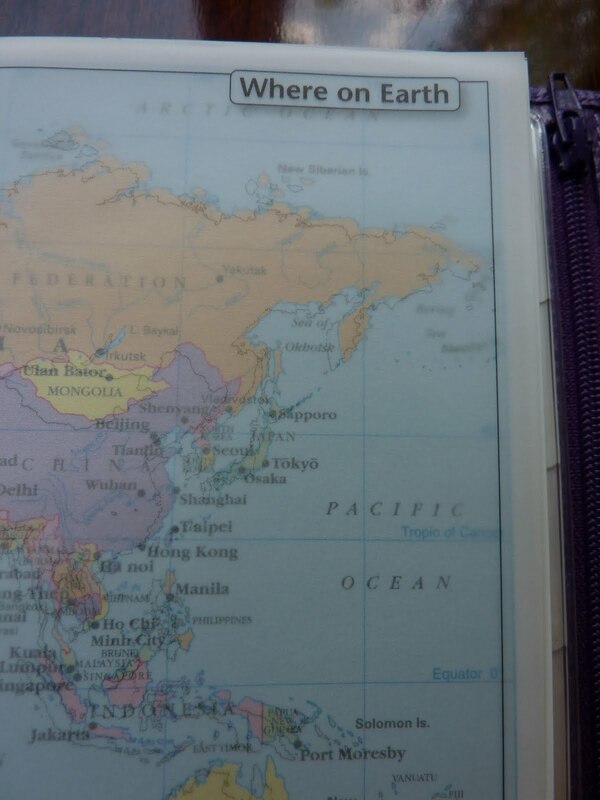 There's also a cool chart of Where on Earth to go. I like having a traveling wishlist! My favorite part of this pack are the lists. It took me more than a decade of traveling to figure out just how incredibly important preparation and packing lists are. The Travel Planner lists are in the form of a countdown: things you need to do for Advanced Planning, Not Long To Go, One Day To Go and And We're Off! I cannot stress enough how important lists like this are! Also there are several pages of packing lists in categories like: Essentials, Equipment, Clothing, Accessories, Style & Hygiene, and Health & First Aid. 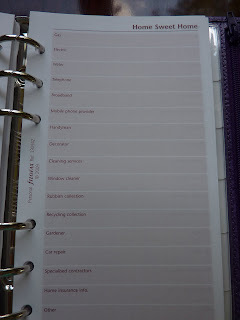 I especially love that your Filofax is included in the list so you don't forget to pack it! Other features include 6 blank tabbed dividers and a transparent top-opening envelope for ticket stubs and other papers you want to keep. There are even a few pages of travel games for when you're bored waiting for your train/ plane/ bus. Some other very useful pages: monthly temperatures of several cities worldwide; international clothing and measures conversions; pages for telephone numbers and websites; International S.O.S. 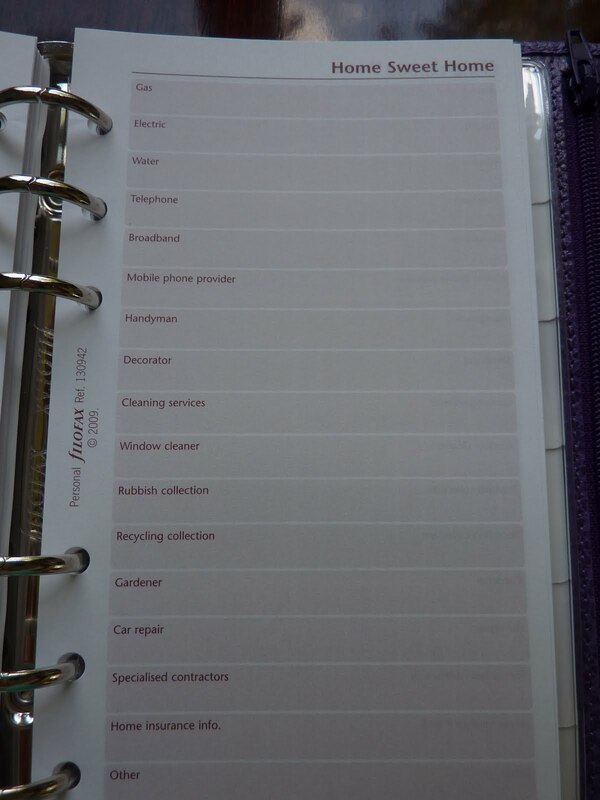 so you can have emergency numbers handy; shopping lists; to-dos; and some blank pages for notes. This is a very well thought-out packet that I highly recommend for anyone taking a trip! 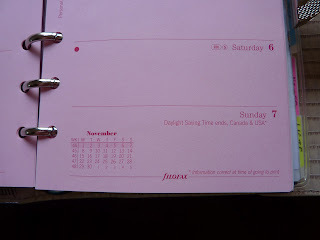 I've been meaning to post photos of this for ages (well, since April at least): while I was in London I bought the personal size Week on 2 Pages diary insert in the gorgeous pink color! I thought it looked fun and I love how the pages look in my ivory Deco! 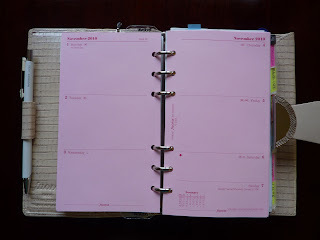 The pink week on 2 pages has the same great features of the plain white version including holidays printed on the day's space, phases of the moon, and the current month with this week highlighted. Is it Friday again... it must be... and nearly the end of the month too. 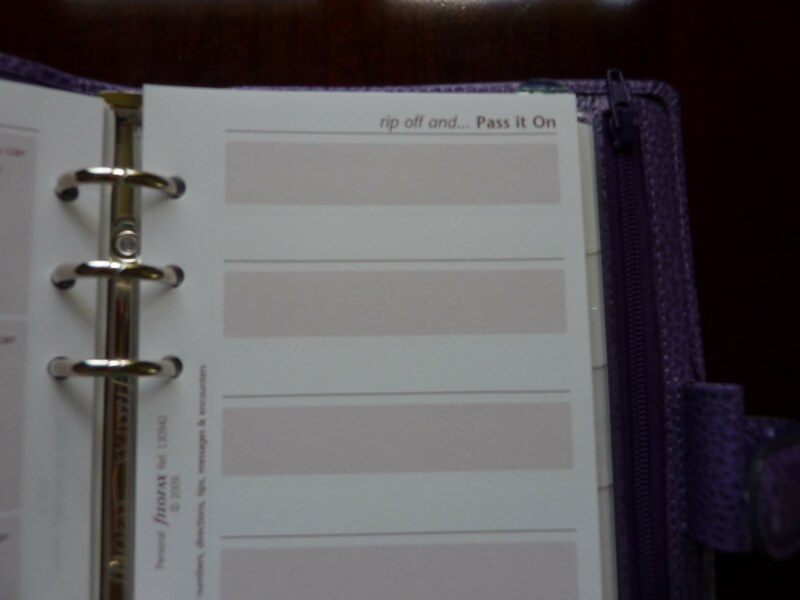 So with holidays just around the corner for most of us, are you adapting your Filofax in any way to cope with your changing life? 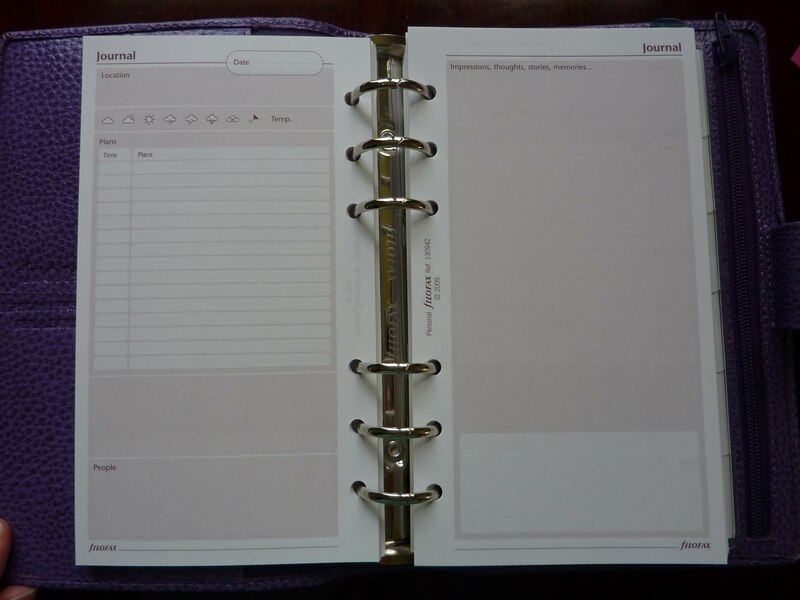 And of course you are more than welcome to discuss anything Filofax related here... no vuvuzela horns here please!! Vintage Travelfax: real or fake? 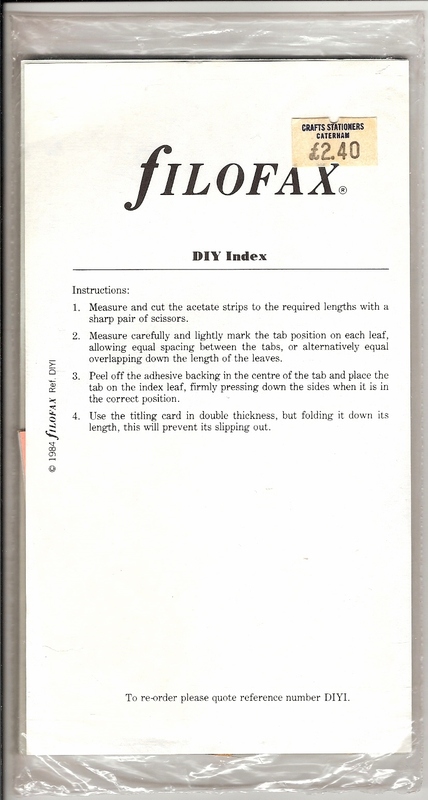 Many thanks to reader Bernhard for this heads-up on a vintage "Travelfax" Filofax available on eBay. Click here to see the eBay page. Does anyone know if this is authentic or a fake? If it's real, do you know when the Travelfax Filofaxes were produced? 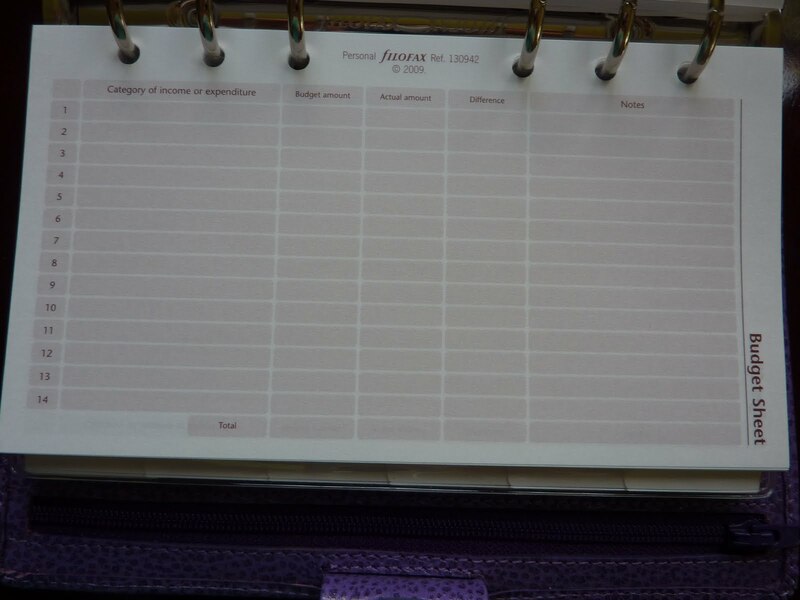 We've talked about this before, but I'd like to see all the different ways Philofaxy readers use their Filofaxes beyond diaries and contacts. For example, I use my personal Domino as my Scotland travel Filofax. 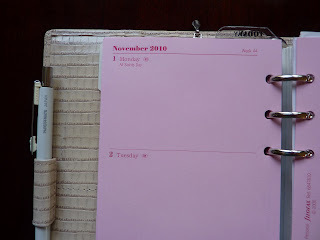 Yvotchka uses her gorgeous slimline Amazona as her Financial Filofax to keep track of expenses and bills (love this!). I know Steve uses his Slimline as a wallet. What other uses do you have for your Filofaxes? Things here on my end are really gearing up. Summer is in full swing, and I'm spending a lot of time with the kids at the pool and on the playground. At home I'm doing lots of move preparations and getting things ready to go in a couple of months. For my lists and preparation info I have multiple Filofaxes going and sometimes that adds to the confusion. I'm thinking of streamlining somehow. There's no mention of Filofax in the article... but it is a fairly natural progression that would lead to people going back to a Filofax if at the moment they are dependent on their phone, PC, PDA etc etc. Name the best thing that happened to you today, no matter how small it was.. record it and in a few years time you can look back and smile about it..
Well Friday is here again. I've been busy unpacking, and it was a relief to find my box of Filofax things (spare inserts, organisers, punches etc) in a specially highly visible box! So that side of life is back under control. Planning the move was one thing... now the other side of the move is another thing. 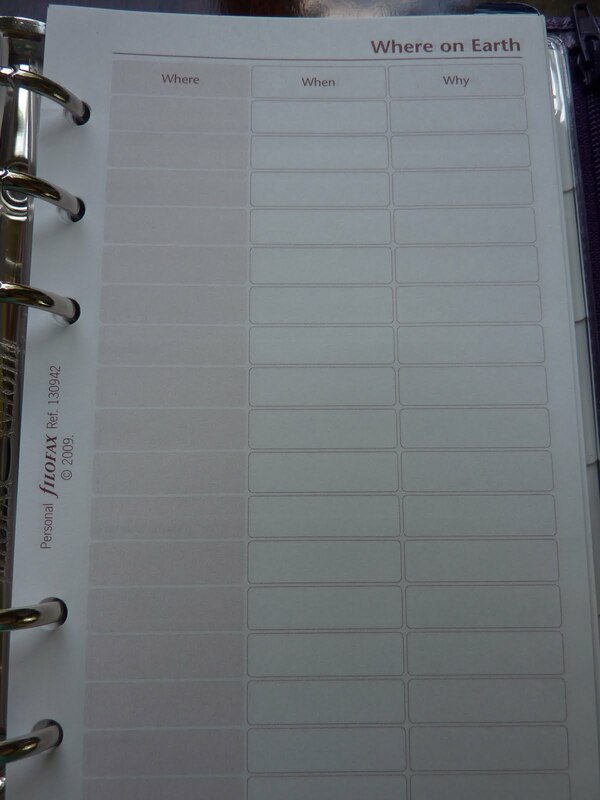 My Filofax organisers are of course helping me with the zillions of things to do and remember. I've even brought my Filofax Pocket Finsbury back in to use again, it's great for those last thing at night 'I must remember to do x or y tomorrow' type notes. I will also try and find time to write about something other than about moving house! Look what I have just found! OK I am still unpacking... but I had boxed all of my Filofax things in to one box, that was well labelled and I found it easily the other day. Then this afternoon I was unpacking yet another box....I'm sure someone is repacking them at the other end of the house! 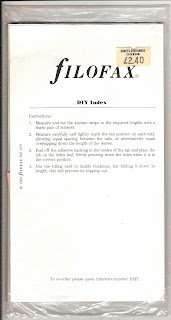 And I found a 1980's DIY index, still in it's plastic wrapper, still sealed with the price tag on it. As you can see I didn't even want to open it to scan it! I can remember buying quite a few of these for a project I did for a friend of mine, this must be one of the left overs! She was using a Filofax binder (bought empty I presume) to create a training manual and she got me to create the pages for the manual by printing on to Filofax fan fold paper... I still have some of that too... but no printer that will take it these days! The section index had our own lettering on it that spelt out PARTNERS on it, but I forget what it stood for, it's a long time ago now! I know you can get similar blank indexes these days but you actually cut the tabs to your own length and then stuck them on with these old ones. Anyway click on the picture and see something from yesterday year! This weekend I am going to Croatia for a few days, which I am very excited about! Has anyone been? I've heard it's cool. But, you know what that means for me: Travel = Planner Crisis. You would think I'd have this figured out by now!! To my credit, often when I travel it's to Scotland, and I do have a designated Filofax just for traveling to Scotland (which works great for me and I love it). But my current situation is this: I don't want to bring my A5 Domino on this trip. I have tons of work stuff in it that I don't need or want to bring with me. I'm only going to be there for a few days, but there is certain information that I need to have with me: emergency and medical info, contacts, travel reference info and numbers, etc. 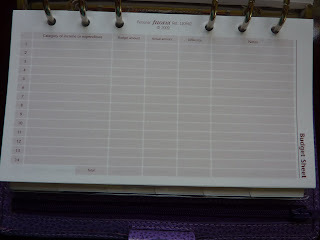 So, I've decided to turn my purple personal size Finsbury into my Travel Filofax for non-Scotland travel. And, what a great opportunity to try out the Travel Journal Lifestyle Pack that was very generously given to me as a sample by Brigitte at Filofax in London! You can expect to see my review soon after I get back! Welcome to summer! June is in full swing now. 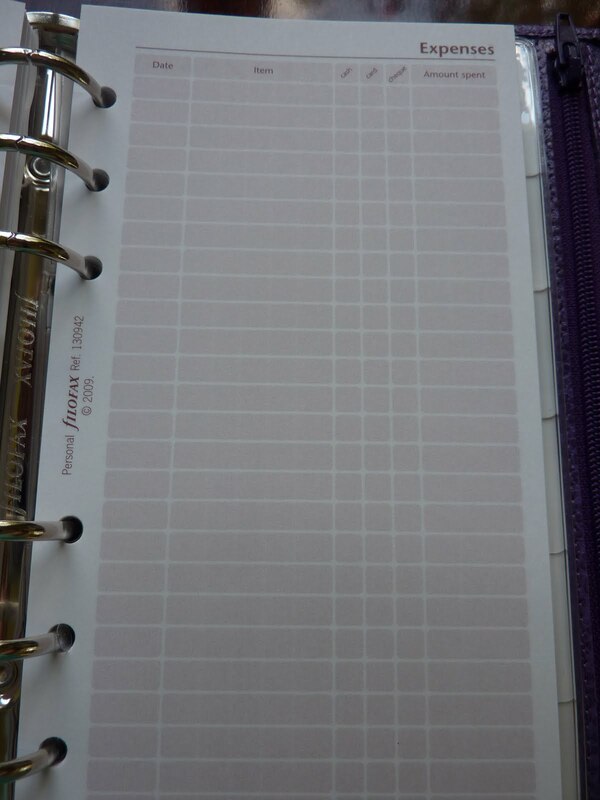 Are you using your Filofax to plan any summer trips or other events? Tell us all about it! And, as always on Fridays, the floor is yours to discuss anything Filofax-related. Philofaxy mentioned in branding article! 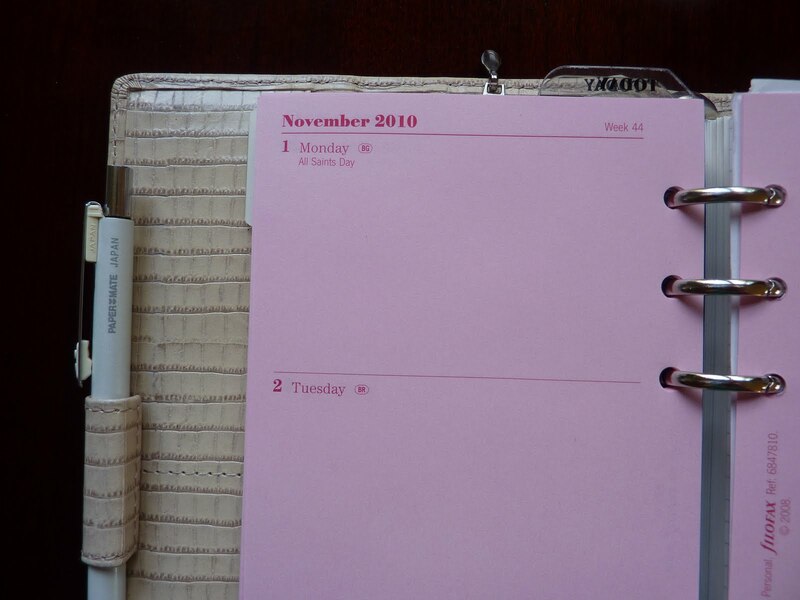 Our blog was mentioned in this article about the Filofax brand and its enormous appeal. Cool! Erin very kindly emailed me some photos of her new aqua Finsbury that her husband gave her as a gift! Lucky lady!! I saw this new Finsbury color while I was at the Filofax shop in London. It is gorgeous, I love how saturated the color looks. I think this color will be very popular this year! And, as with all colored Filofax models, if you like it you should get it quickly because you can bet it's being produced this year only!